We had our first opportunity to explore mainland Australia two weeks ago when we took a quick trip to Sydney to spend the weekend with friends. 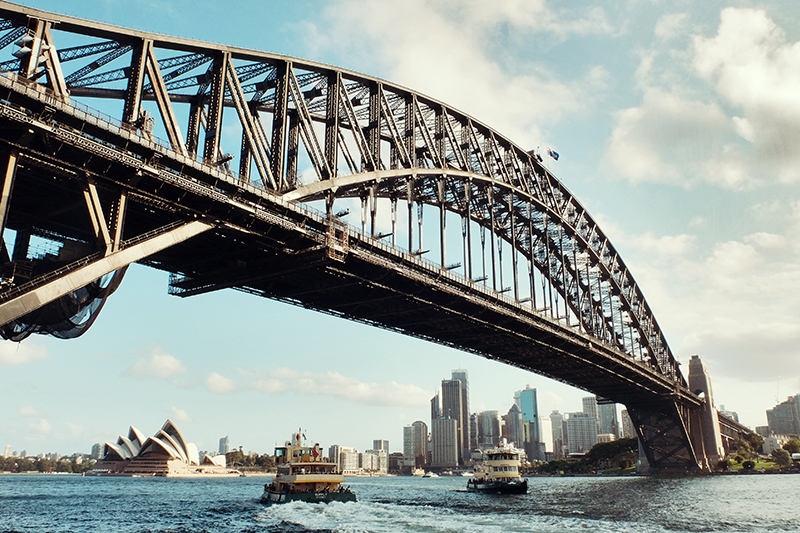 Given the size of Sydney as a major metropolitan area, a weekend is simply not going to cut it when it comes to seeing everything there is to see. However, with a little bit of planning you can certainly give it a go and make the most of it. On our previous trips to cities like Paris, Barcelona, Munich or Prague we’ve only had a few days to see as much as possible it becomes a case of picking a handful of key sights and racing around to see them before time runs out. I think you ideally need at least a week in any big city to truly do it justice and take everything in. We arrived with our Catalan friend who having travelled here before knew a bit of a workaround to get into the CBD without having to pay exorbitant airport transfer rates. A pleasant 20 minute walk to the nearest Metro station later and we were on our way into the city before switching trains to Bondi Junction. We decided to go with the Airbnb option and stayed in a nice apartment near Waverley Park in the middle of Bondi, right next to the bus lines and a short stroll to the nearby shops. We arrived a little late for exploration so decided to have a chilled night in our accommodation and ordered in some yummy Mexican food from one of the local eateries. The next day we were to meet up with our other Catalan friend and Sinéad wanted to go shopping, which wasn’t particularly high on my to-do list. I opted instead to do a spot of street photography and wandered the streets around the CBD, Ultimo and Broadway before meeting back up with everyone for a cup of coffee later. 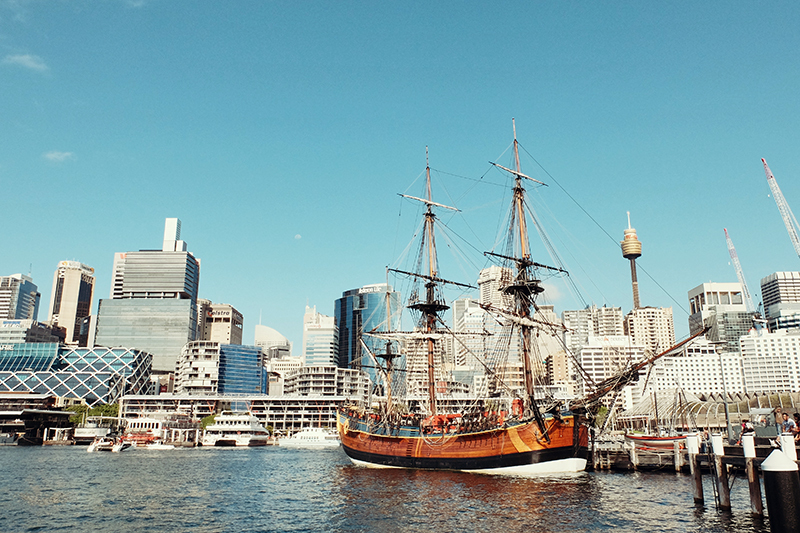 Having lived in a small town of 100,000 people for two years before moving to Hobart’s slightly larger size, it was a bit of a blast to senses walking around Sydney. Massive skyscrapers, endless traffic and people of all walks of life make for an exciting experience and the hustle and bustle was a welcome change from the sleepy atmosphere of Hobart. I love just walking and exploring and Sydney is a great city to do that in. You can go from high end boutique shops on one street to run-down diners and cafes on another or suddenly find yourself in what seems to be another country as you enter Chinatown, it can be quite bewildering at times. One of the drawbacks of big cities is that they rarely give a sense of the country they’re built in. Sydney didn’t feel Australian, in the same way that San Francisco didn’t feel American or Prague feel Czech. There’s so much development and commercialism combined with a cultural melting pot that a nation’s identity is somewhat lost in its major cities. I always recommend that people travel outside urban areas to truly experience what a particular country is about. That isn’t to say that city breaks aren’t enjoyable, far from it. I love getting lost in the urban sprawl and exploring little side streets and lesser known areas, they’re often where you’ll find the hidden gems. A nice connection to my hometown of Portmarnock where Charles Kingsford Smith took off on a circumnavigation of the globe in 1930. There are many instances of Old meets New in the city centre as old colonial buildings are dwarfed by their modern glass and concrete cousins. Came across this cool street art while on my random wanderings around the city. Another Irish connection with Richard Bourke, a former governer of New South Wales. A large statue of former Prime Minister, Ben Chifley towers over this plaza in the city. The Rocks area is home to a plethora of market stalls selling all sorts of wares. The magnificent One Central Park building is literally covered in plants from top to bottom. Came across this quaintly colourful building in Glebe, an area with a really funky hippy vibe. Always nice to see some decent graffiti or street art instead of the usual awful tags and scribbles. The beautiful picture postcard shopping centre that is the Queen Victoria Market. The following day we decided to venture down to Bondi beach and see what the fuss was all about. The famous beach itself was around a 20 minute walk away and despite the cloudy weather it still had that surfers paradise vibe with dozens and dozens of boards in the water. The lifeguards were running constant drills in and out of the water to make sure that everyone stays safe and the whole place had a really nice chilled out vibe. We decided to do the coastal walk along the cliffs to Bronte beach which is a nice scenic walking path along the shoreline where many people decide to go for a stroll. Along the way you’ll pass a number of smaller beaches while making your way along the occasionally crowded paths. We took a bus back into town and took a lovely stroll around the Darling Harbour area. It’s a mix of major hotels and restaurant chains all watching over a harbour filled with high fliers partying on their yachts and having lobsters served directly onto their decks from the surrounding restaurants. Sinéad and I decided to check out the Madame Tussauds Wax Museum while Eli and Joan Marc went for a stroll into Chinatown. Madame Tussauds was really great and the models were amazingly lifelike. There was a brilliant focus on interactivity perhaps reflecting the modern culture as all the models were just begging to have selfies taken. There was of course an Australian focus to the celebrities on display but there were plenty of other big names to take selfies wi…..I mean….study. After a quick jaunt around the museum we met back up with our friends in Chinatown and enjoyed a nice meal before queuing up for some delicious fried Chinese desserts. Surfers flock from all over the world to sample Bondi’s waves. The artwork along the edge of the beach is really nice and well maintained. Another nice piece on a shutter near Bondi beach. The walkway along the shoreline offers lovely scenic views of Bondi Beach and surrounds. The pathway along the coast is a popular spot with tourists and local fitness fanatics alike. We’ve seen the Irish connections in Sydney, now it’s time for the Tasmanian ones. 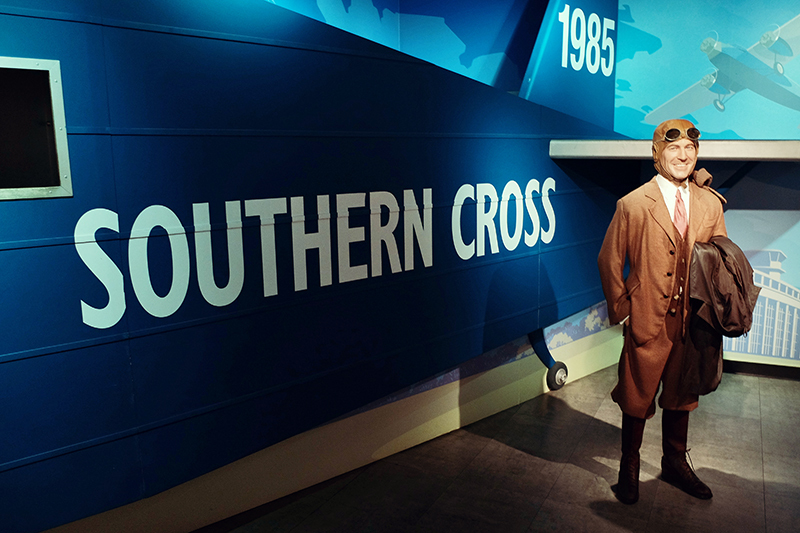 The very first statue you see in Madame Tussauds is of Truganini, the last full blood Aboriginal Tasmanian. A nice touch. There’s that Portmarnock connection again with Charles Kingsford-Smith and his famous plane. The detail on the wax models is just amazing and creepily lifelike. A nice homage to the legendary Mr. Hitchcock. The entrance to Chinatown in Sydney. Came across another interesting street art scene while wandering around Chinatown. The night was still young so we decided to continue our adventure and take one of the harbour ferries out into the bay as you can’t really come to Sydney and not get out onto the water. It’s like going to Paris and not climbing the Eiffel Tower or visiting the Louvre. The ferries very handily operate on the same Opal travel card system as the buses and trains which makes getting around an absolute breeze. We were going to just go for a spin from Darling Harbour and get off at Circular Quay but something caught our eye on the way…..Luna Park. It’s a theme park originally built in the mid 1930’s and you feel like you’ve travelled back in time upon walking through the giant smiling entranceway. The styling of the place is fantastically retro, unlike the pricing but then again, it’s a theme park right on the edge of a major city so it’s hardly going to be cheap. We enjoyed a nice stroll around the grounds where a big Indian family were having a wedding party (Great idea!) before continuing around the base of the Sydney Harbour Bridge at Milsons Point. There’s lovely views across to the Opera House from here and the ferry journey back from Luna Park offers even better waterside views of the unique building and its iconic roof. It was a lovely end to an eventful day exploring Sydney, or at least this small corner of the city. I think given our limited time we saw plenty of sights and I thoroughly enjoyed the experience. We’ll be off to Melbourne for the festive period so it’ll be interesting to see how the two compare and which is nicer. Sydney will certainly take something special to beat that’s for sure. The lovely waterfront playground at Darling Harbour. One of the Sydney Ferry boats that we took for a spin around the harbour. 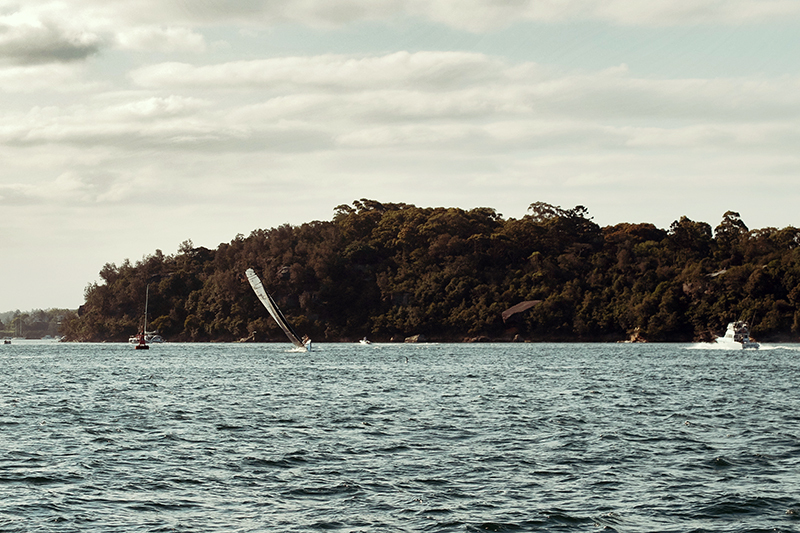 The harbour is a sailor’s paradise with numerous yachts, speedboats and pleasurecraft zipping back and forth. The iconic entrance to Luna Park. 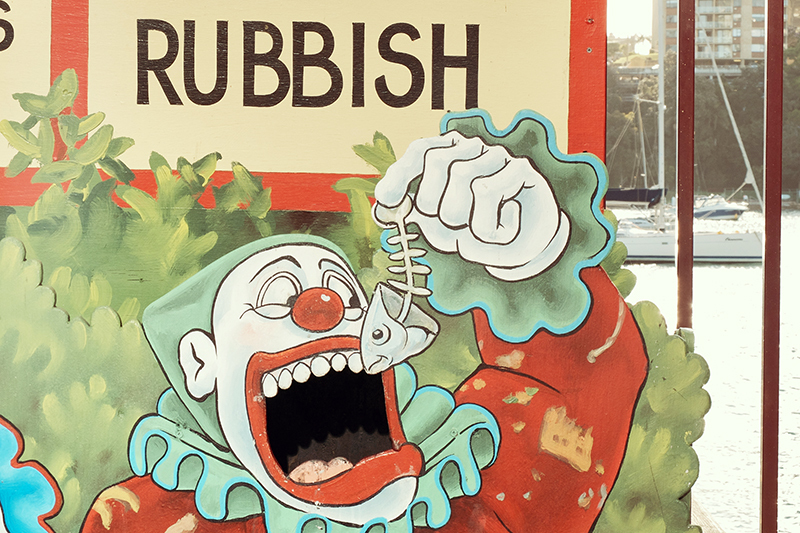 If you’re not a fan of clowns look away now. 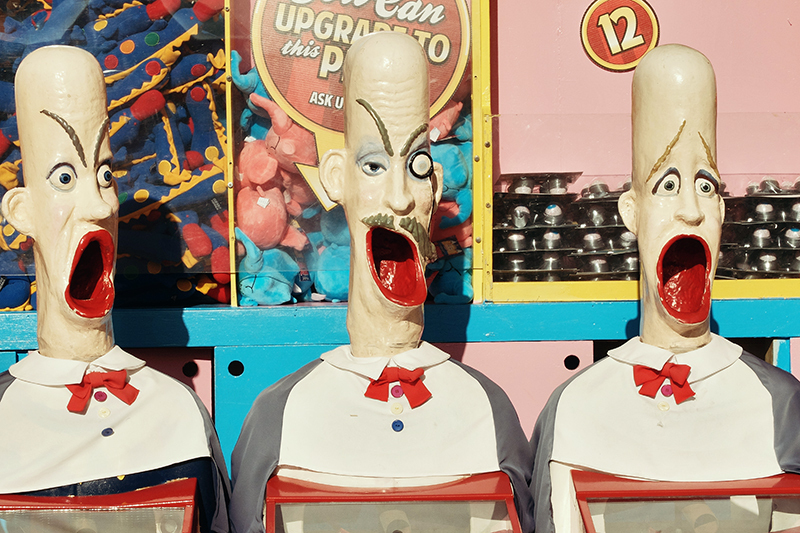 These spinning heads perfectly sum up the eccentric, slightly macabre atmosphere of Luna Park. 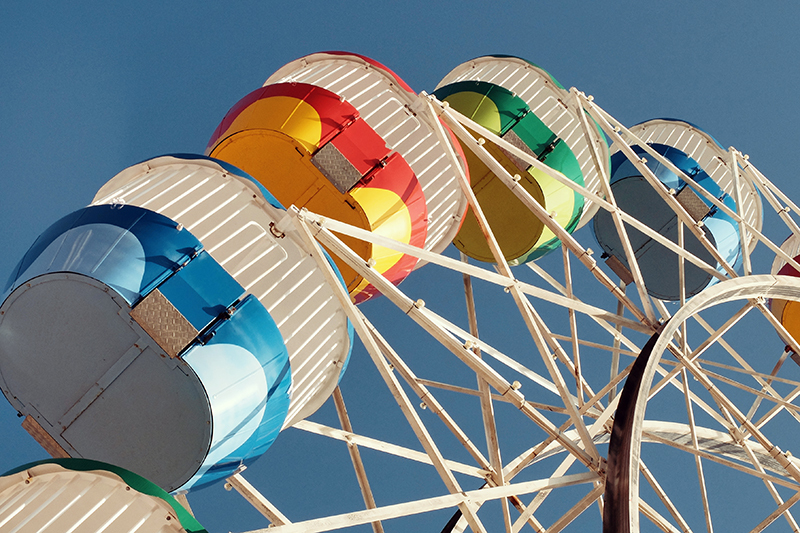 The wonderfully colourful Ferris wheel. Even the bins had a funky design continuing the theme of the park. The area around the base of the Sydney Harbour Bridge offers fantastic views of the city and Opera House. 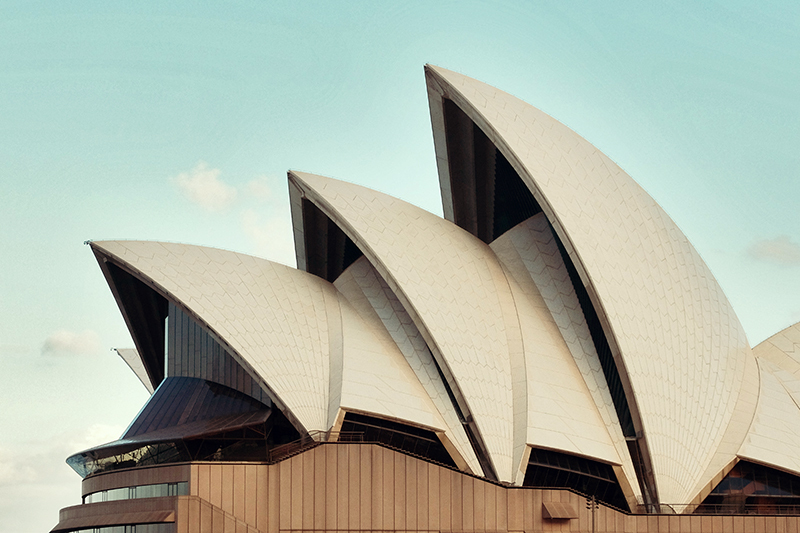 Jørn Utzon’s Sydney Opera House is one of the most recognisable buildings in the world. A classic Sydney scene with the bridge, the Opera House and ferries on the harbour. 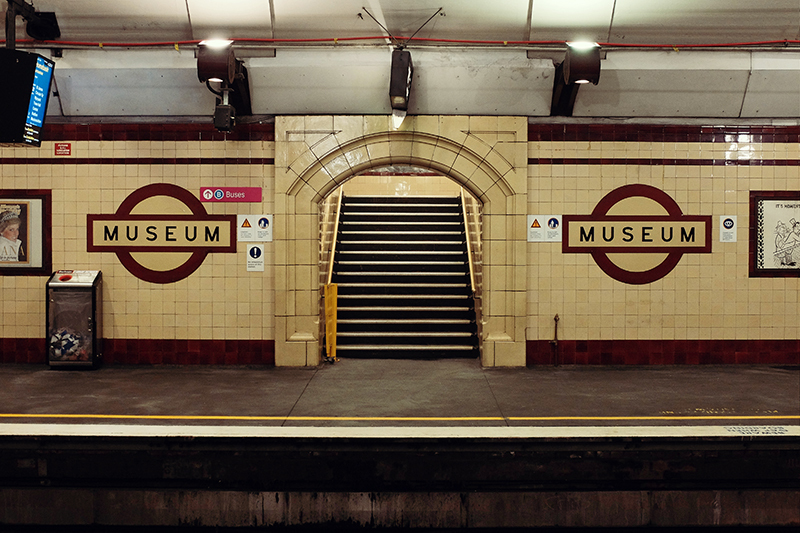 The Museum Metro station bears a striking resemblance to those you see in London, although its layout is more akin to the Parisian Metro. Either way it’s definitely one of the prettier stations on the Metro system and was our last port of call at 4am as we left for the airport.